We adopted our precious Princess Chrissie from Serbia in October, 2009, the same month that Chrissie celebrated her fourth birthday in the arms of her new forever mommy and daddy. Chrissie was born with several severe congenital heart defects. Chrissie was registered for international adoption when she turned 3, then a total of four different families committed to adopting her, only to back out when they found out more about her medical needs. God called our family to adopt Chrissie, and when we asked God why all of the other families backed out, He said, “Because she is yours.” We joyfully obeyed His call, and Chrissie was able to spend 6 joyful months with our family in Texas and another month fighting for her life after open-heart surgery in San Antonio, Texas. The story of Chrissie’s battle for her life is told on our blog. Click HERE to read a little about Chrissie and her heart condition (this post was written April 16, 2010, and Chrissie’s open-heart surgery was performed on April 19, 2010.) You may find the whole story of Chrissie’s fight for life recorded on the blog from April 19 – May 19, 2010. Just go to the sidebar on the home page and look under the “Archives” tab . Go to April 2010, then look for the first post of her hospital battle, beginning April 19, 2010 (or simply click HERE to begin the story). God shows Himself BIG TIME throughout her journey to Heaven, so grab a box of tissue and buckle your seatbelt for a faith journey that’ll touch your heart deeply. You will witness miracle after miracle. God is good. Having Chrissie leave us to go to Heaven has been hard. Very hard. But every one of us all agree that it was worth it. There is not one bit of hesitancy when each member of our family answers the question, “Would you do it over again? 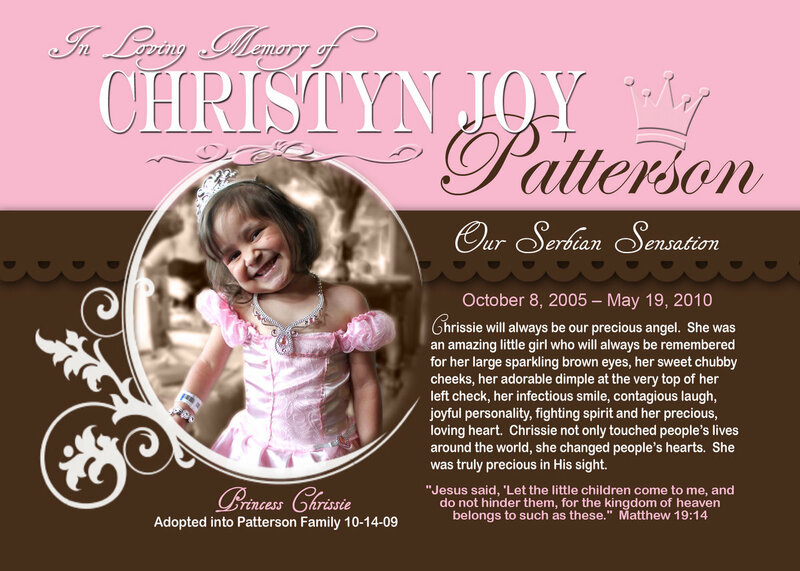 Would you say yes to adopting Chrissie if you knew she would go to Heaven on May 19, 2010?” YES, YES, YES! We all agree that loving Chrissie and being loved by Chrissie for 7 months was ABSOLUTELY worth it, and if we had the chance to do it over again, we would definitely say YES. God is faithful. His grace is sufficient. When we are weak, He is strong. Click HERE to read “God Nods” of how God continues to connect us to Chrissie and Heaven. Click HERE for a list of Grief Resources we’ve found helpful. “Boss Your Heart”: Many of you have asked me about the meaning of “Boss Your Heart”. I had no idea that God would use that phrase over and over again with such great significance. At the time that the “boss your heart” episode occurred, it really meant nothing to me, it was simply the words that God was giving me as He helped me “coach” Chrissie into life during a “do or die” moment. You may click HERE to read about that moment. Then, on the morning that Chrissie went to live with Jesus, before I knew she would be going Home that day, I posted a surprise “Boss Your Heart” necklace (you may view and read about it HERE) that ended up being used as a memorial tribute to Chrissie and her amazing Boss Your Heart day. God never ceases to amaze me. His timing is always perfect, even when we may not realize it in the moment. Never doubt His sovereignty. Click HERE to view a slide show of Chrissie’s life in our family. Such a sweet girl, so full of joy. Be blessed by her sweet smile and precious dimple on her upper left cheek! Finally, here is the video (divided into 14 parts) from Chrissie’s Celebration of Life held at Hays Hills Baptist Church on Sunday, May 23, 2010. Many thanks to Melody Valadez and “V Productions” of Driftwood, Texas, for their generous gift of videography and preserving the precious memory of our princess. We are most grateful.